Hooray! Spring is officially here! That is good news to my state of mind. I've been waiting for the grass to grow, and bulbs to pop through! It's our first year in the new house, too, and that means a lot of newness! Spring dresses, baking with windows open so the neighbors get jealous, and lots of cooking with my new tools. I want to share that my excitement with you in our Spring in the USA event! All of the bloggers in our hop are giving away items made in the USA! I'll have two winners! Winners will be random, and I can't guarantee you will get the prize package you'd like. On Via74, I adore the Buffalo Jill Cardigan in Blue! It's too cute! From Earlywood, I would love to add the tasting spoon set to my kitchen! The colors are marvelous. I think the May Flowers top from Via74 would be perfect for spring. I would like to have the long bread board from Earlywood for my homemade loaves. I would display the Acorn rolling pin from Vermont Rolling Pins. I love all the clothes. Anything for spring and anything for the kitchen is great to me! I could definitely use a new rolling pin! The Abbreviated Elegance Dress is so pretty, and just my style. I love the Bohemian Beauty Cardigan in Grey. Would be great for spring. I love the American Beauty cardigan! Would love to have the the trifecta. I never even heard of it before so I would love to find out what it's all about. The medium classic ladle would be perfect for my kitchen. I like the The Acorn Rolling Pin. It's very pretty. The beehive rolling pin is my favorite. I love the Abbreviated Elegance Dress. I'd like the medium classic laddle. I really like the Flame rolling pin. I like the Easy Breezy Cardigan in Navy. Thank you! I like the Shaker Rolling Pin. The butterfly wings top is really cute. Although to be honest I love all their clothes! I need the large spreaders sampler, the colors are so pretty! The Vermont Rolling pin I am would want to display is the bee hive. The details are beautiful! The Bohemian Wrapsody dress is so cute! I like those Tasting Spoons. Cute! I like the Flame rolling pin. 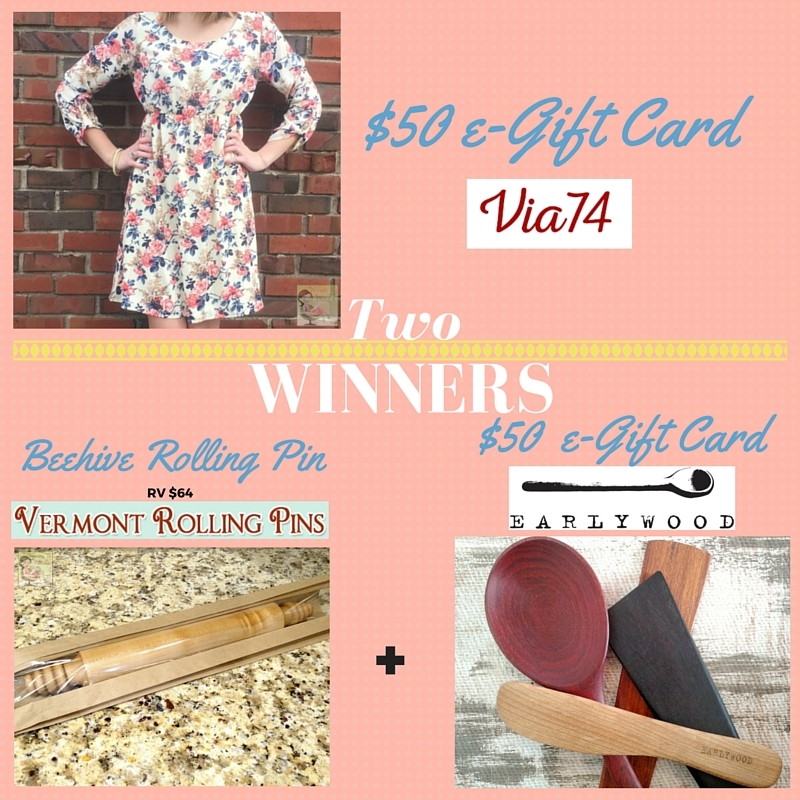 From via 74 I love the Bluebird Dreams Dress, i'd love to add the medium classic ladle to my kitchen, and I would love to display the personalized rolling pin. I can't live without the Light & Swingy Top in Teal at Via74! I would love to add the mini cutting boards/serving set from Earlywood! I would display the Christmas Rolling Pin from Vermont Rolling Pins! The rolling pin and the kitchen utensils are gorgeous. They would be perfect in my kitchen! I want this kitchen items!! I can't believe that it is spring already! I feel like it just became winter (not that I am complaining)LOL. Spring is just a gorgeous time of year. I'd love to celebrate the new season with new things for my closet or kitchen. How cute are the baby & toddler spoons? I'd love those! Wow, how fun. I am so ready for Spring. Ready for Spring dresses and capris... sandals and fun! I am just so ready. Thanks for the chance to win! I can't live without the Blue Fancy top. I like the walnut handle pizza rocker. I love the rolling pin and the wooden utensils!! What a great giveaway hard to believe it is spring time already. What a fun giveaway for Spring. I'll have to look through everything to see what is up for grabs. Wow. I have been a huge fan of early wood for almost a year. And, a follower of his quality work. Other than one of everything..start with the 4 mini cutting boards and the large too. Hehe, I am a current fan of Vermont Rolling Pin too! The personalized pins are awesome gifts for weddings. And, out of my price range but love the Italian pins. I love that long bread board, but I also love the set of mini boards! That is a great giveaway. I would love to have the rolling pin. What a great giveaway! Thanks for sharing! What a beautiful giveaway! I'm sure my wife would love this I wish I could enter on this giveaway. Super cute clothes and a great giveaway. The Beautiful Dreamer dress is so pretty! My friend has a Bee Hive rolling pin and she loves it. This is a great giveaway. The Dance Teal Dawn dress is absolutely gorgeous! I love love love it. I would choose the Medium Classic Ladle in the Jatoba wood from the Earlywood shop. I like the Flame Rolling pin and the Acorn Pin. Both would be beautiful for display. I'd love to don the Ace of Diamonds Dress from Via74. I love the mini cutting boards/serving set from Earlywood. I really like the Cozy Cabin Thermal Top in Grey. I'm always baking bread, so the long bread board would be wonderful to have. I would love to own the Shaker Rolling Pin. I can't live without the Angels in Your Angles Top. From Earlywood, I would like to get the the trifecta scraper. I like the chevronicity shirt. From Earlywood, I like the trifecta. Wow, it's hard to choose! I would love to display all of the rolling pins. I guess the Beehive is a beautiful one if I had to pick just one. I would love the The Monster Rolling Pin and Personalized. That would be a super gift from Vermont Rolling Pins. I like the Tasting Spoon set. I just love the Blue Fancy Top. I'd love the Long Server! I'd choose the Wide Ergo in Cherry! I really like the Top Of The Morning Floral Sweater from Via74. My favorite Rolling Pin is the Acorn Rolling Pin. I love the Easy Breezy Cardigan! I would love any of their utensils! If I have to pick one I would choose the Trifecta set. I really like the Boho Blossom Top it would be so cute for summer. I love wooden utensils and would love to have the tasting spoon. I really like the Shaker rolling pin, it's nice and simple. They have a lot of cute items.One I really like is the May Flowers Top. I would love to have the coffee/ dry goods scoop. The Acorn Rolling Pin is really nice! I am absolutley in love with the Rambling Rose dress at Via74. It is so beautiful! I love that it has longer sleeves and I love the rose print. I really love the Angels in Your Angles Top. It's super cute and would be great for wearing in the spring. Thank you. I love the Bohemian Beauty Cardigan in Black! I would love the Medium Classic Ladle! I love the Bohemian Beauty Cardigan in Black. I like the Modern rolling pin in cherry. I can't live without the Up and Coming Kimono Cardigan! SO cute and perfect for chilly evening by the campfire. I like the long bread board from Early Wood Designs. I like the Beehive Rolling Pin. The Light & Swingy Top in Teal top is adorable! I love the criss cross design on teh bottom! the trifecta looks like a super neat kitchen utensil to add to my kitchen collection! unique! I love the children's rolling pin! my daughter loves to cook with me! that'd be so cute! Wow, I love the 'pretty in pink' sweater jacket, perfect for spring! I would choose the 'mini cutting boards' and they would get daily use in our home! I would probably choose the Vermont 'french pin', I think I would use this one more than the others. I think the Better Off Plaid Hoodie from Via74 is adorable. The Tasting Spoon from Earlywood is great. I would love to have this in my kitchen. My mother would love these gorgeous rolling pins. I think she would like the Beehive Rolling Pin the most. I would like to get the Boho Blossoms Top. I love the blue fancy top. The mini cutting boards are so cool! I would love to get the child's heirloom rolling pin for my grandson. I just love the blue highway shirt. I would love to add the tiera scraper to my drawer. I just love the monster rolling pin. I like the Trifecta - beautiful woods! The Beyond Basic Tees in White and pink are classic and have a great cut! I like the Beehive rolling pin in Walnut. i would love to have the "s flat sauté"
i would really like to have the Beehive Rolling Pin. I love the Pocketful of Daisies Dress. It is perfect for a casual spring day. I would love to have the medium classic ladle.